Shadow: Rejecting evidence that conflicts with dearly-held beliefs. Arguing with others just for the sake of doing so. Nit-picking. Putting off a decision because you’re afraid to face the consequences. Preventing others from getting the information they need to make good decisions. Story: The Main Character must defend his or her decisions. Alternatively, the Main Character rejects critical information and makes a bad decision. Relationships. You may be in denial; if so, you’re only fooling yourself. You serve your own best interests by seeing things as they really are. Stop avoiding unpleasant confrontations. An honest disagreement is better than a false peace. Work. Consider all the facts before making your decision. Once you’ve made your decision, be prepared to defend it with well-reasoned arguments. If others continue to reject your counsel, be aware that you may have to let go, sit back, and let time prove that you were right, after all. Spirituality. Spiritual maturity demands we see ourselves as we really are—and love ourselves in spite of our shortcomings. Rather than debate whether or not you’re “good enough,” be thankful for the progress you’ve made thus far. Avoid beating yourself up with high-minded standards of perfection. Personal Growth. What are you avoiding? Growth awaits the souls brave enough to cast aside blindfolds and see the situation for what it really is. Get past this personal stalemate by taking time to think clearly about what you want and where you’re going. Fortune Telling. Sometimes, the only way to win is to refuse to fight. You’re stuck for now; let time pass before taking action. When? Between September 23rd and October 2nd. The Blindfolded Figure. 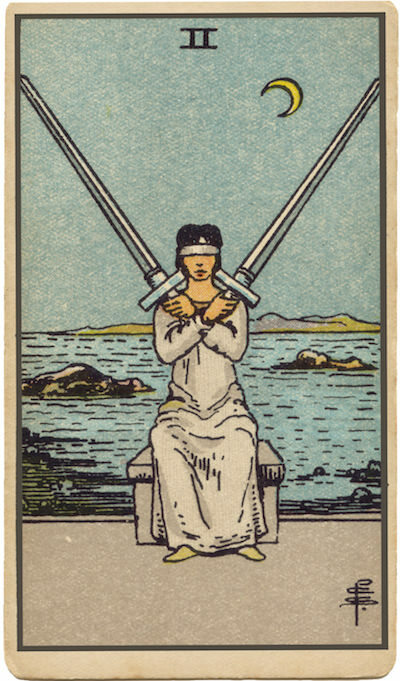 In RWS-inspired decks, we frequently see a blindfolded woman grasping two broadswords. Set apart from the waters of intuition, she is depending solely on logic to make a difficult decision. To what extent are your own decisions informed by logic? By emotion? The Crescent Moon. Many versions of this card depict a sky punctuated by a crescent moon—a symbol for receptivity and cyclical change. What would happen if you took a “wait and see” approach to your current dilemma? How might your situation change over time? Different Ways of Thinking. In your situation, is it more important to think fast or to deliberate slowly? How can you declare a truce between frenzied thoughts and the need to think carefully? Could meditation help find an answer? The Blindfold. In your situation, is there value in not knowing certain things? Should some information be repressed or ignored? The Marseilles Image. The curved blades on the Two of Swords are hardly recognizable to modern eyes. They are crossed (suggesting conflict); between them, an elaborate flower blooms (suggesting growth). Faced with two options? Try evaluating each option in terms of the growth you’ll experience, should you adopt it. What information do I need to get past this impasse? How can I get past being defensive and see the facts? What viewpoints, other than my own, play a role in this situation?